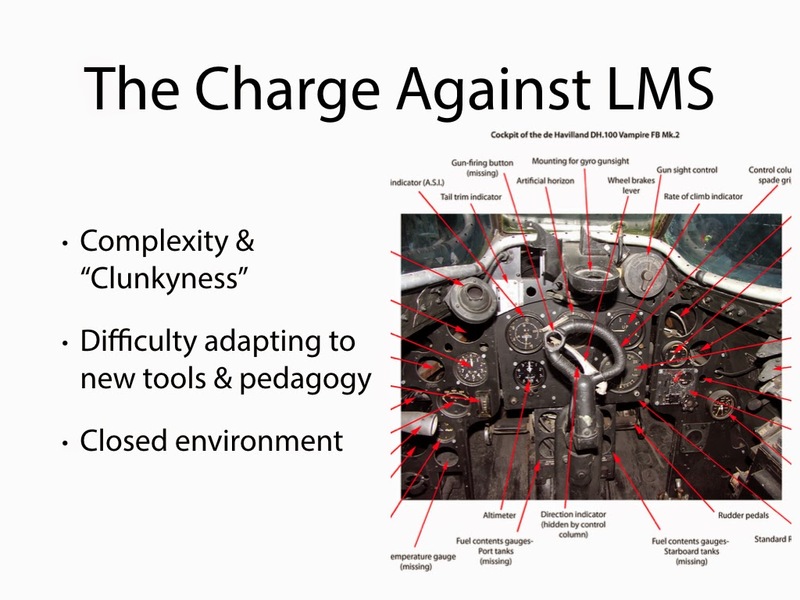 For my talk at BbWorld, I contemplated what it is that people hate about LMS's in general. I summarized these issues in the visual shown here. The topic "What people have about X LMS", where X is often, but not always, Blackboard, is one I chose not to get into at BbWorld. There's plenty that's been written and spoken on that topic. Are there other things about the LMS that aren't captured here that you think are important? Or does this pretty much cover the difficulties that make you, your faculty, or your students frustrated with your LMS? If you think I've missed something I'd be grateful if you'd comment below. I'm particularly interested in the third topic, which I think is the most interesting and the most deeply imbedded in the fundamental design of the LMS. LMS's are closed because they were designed to be that way. As I've argued here before, the LMS mimics traditional classes, and traditional classes are closed. In a future post, I'll consider what an LMS might look like if the design was centered on the student rather than the course. Yep, it is the CLOSED nature of the LMS that is a dealbreaker for me; I use the LMS only for the Gradebook (where I need the security); I do everything else outside the LMS using normal tools (Blogger, Google Sites, etc.) that produce real web-based content with LINKS, so both my content and the students' content is linkable, shareable, searchable, discoverable, etc. Looking forward to the next post! I'm a big fan of Google+ and "personal-streamed" systems lik Google+, Twitter, etc., and I'm surprised that the MOOC LMS like Coursera hasn't grasped that such personal streams are the key to real scability. Laura, thanks for your comments. This captures most of it, but for me it's also that the environment itself is so scripted, so controlled by the system that I have little control over how it works myself. It's like everything is happening behind some black box and I only have the user interface that lets me do some things but not others. Then, if I want something to work differently, I have to hope that lots of people want it and then maybe, a long time from now, the company will change it. I work mostly with Word Press (and, like Laura, only use the LMS for the gradebook), and though I don't have full control over it because my coding knowledge is limited, I have much more control than I do with the LMS. Plus, there are many, many plugins that people have created that can help me do what I want. I guess this is largely related to the open source aspect of Word Press: anyone can create plugins to make it do more interesting things, and these can be created quickly. Great points Christina. The recent history of the Internet has reinforced the value of end-user innovation. Trying to build in all the use cases up front is a losing game. Image captures it very well. I hope your also covering an answer or at least proposing answers to the epic fail of the 90s that is current LMS design and implementation. What Christina and Laura have echoed I've seen from our faculty for years also; they cobble together an LMS experience that works by only using the parts of the central deployed / "supported" LMS when it comes to gradebook; and avoid it like the plague as much as possible. 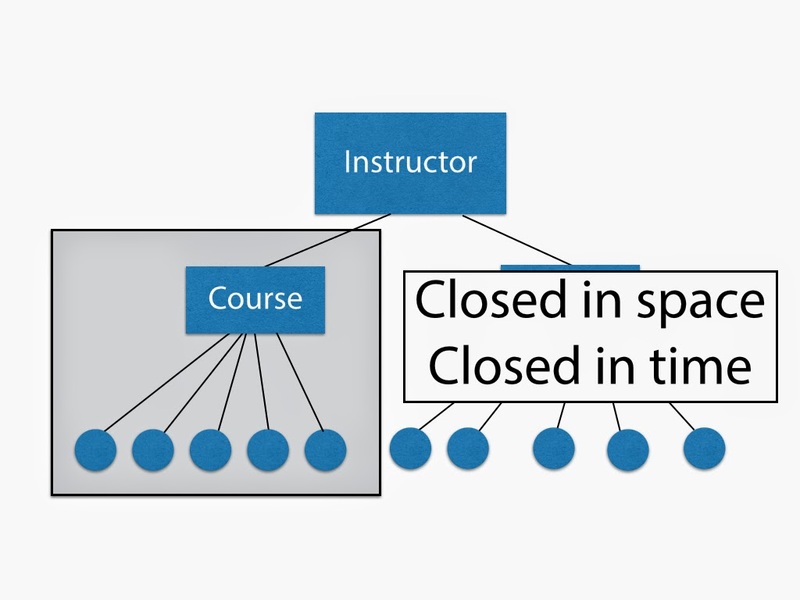 Something I've tried to focus on in my LMS breaking design is also making it course centric. LMSs are section / logistics / folder structures / bs centric instead of focusing on the topic that we're all getting together -- the course and the course material. The closed connotation of "what section your in" is silly. Thanks Jeremy - good article, although I am not as optimistic about Canvas as you are. That's funny. I used almost exactly the same picture for a presentation on how NOT to design technology about five years ago. I've long since given up using the LMS for my own instruction. It commits the classic McLuhanesque mistake of trying to transfer one communications medium (the classroom) to another (the virtual world) wholesale and, as such, it fails. The problem is not a technology problem. It's a people problem. Faculty want to simulate what they understand and recognize in the physical world online. Software vendors are only happy to oblige because their primary mission is to sell software. Until faculty demand something else, the vendors won't produce anything else. One of the missions of the Teaching Innovation Lab we're developing at HCC is to get faculty to be more mindful of the tools that they use to teach, both inside and outside the classroom. It will take some but I hope that this is where the demand for change will have to come from. It certainly won't come from Blackboard. For those of us tagged with the term "innovation", I think we have an obligation to go beyond the current consensus and do more than paving a better cowpath. What we are asking of an LMS is a range of tasks that can only be partly enumerated at the outset. A cockpit is a tool for a purpose, an LMS tries to be a tool to enable tools for a range of purposes. (yes I know some may say the purpose is educating, but that is much broader than flying). I have a bit more appreciation for how hard this is to do. For years, I've been able to tweak and customize wordpress to do almost anything I wanted. But then I decided to make a wordpress theme that would allow others to customize a site, all form the admin interface. It was illuminating to find how many ways people wanted to do things I had not thought of, or wanted features I did not get into it. Maybe it just means I am a lousy systems designer. But an LMS is a meta tool, and that is like having complex complexity. Like Laura and Christina, I have taught in systems made of the various various sizes pieces joined, and used an LMS for gradebook, group forming, etc. But we, frankly are outliers on the distribution curve of faculty. The LMS aimed to fill the space because we do not have the human support capability to move many teachers into the zone where Laura and Christina are (they got there by sheer will and determination). The idea is to make using online teaching tools "easy". Deliberate quotes, pretty much Facebook exists to make being on the internet "easy". And we have set up an expectation that this can be made easy. Thanks Alan. I was looking for a striking image more than an exact analog. What I really wanted was a picture of the Homermobile, if you know the reference, but couldn't find a good one. If you give an engineer a task that's extremely complex and somewhat vague, to create a system that can perform a wide range of tasks while being very simple to use, in a domain that has no history of building such tools, it's not surprising that you get what we've got now. It's not the engineers' fault (well, some of it is) - the task was doomed from the start. My goal is to participate in a discussion that will get people thinking about the choices we make and how they restrict what we can do. Judging by the reaction, I've hit a chord with a lot of people and I can't ask for more than that. The answers aren't simple but I'm concerned that most people in educational technology (not to mention most faculty) aren't even asking the questions. Here’s feedback from someone who manages the LMS technically and from the product perspective (function, UI/UX, etc.). Those of us who manage the LMS at my institution feel a growing heat over the clunkiness issue and the failure of our platform (Moodle) to deliver an interface that feels modern and comparable to their other web transactions. A recent move to the Bootstrap theming has helped (especially in controlling mobile-friendliness) but the issue remains. The sense is that Canvas represents a next-generation interface and UX, however, I think it’s more that they’ve built their platform more recently and the BB’s and Moodle’s are contending with adapting legacy aspects of their underlying platform. I also think this is an important issue that has affected governed LMS decision-making recently. The cockpit analogy is a good one and I’ve often used the comparison to the vintage all-in-one stereo systems (turntable, cassette, 8-track, radio – lava lamp optional). The monolithic application that embeds key tools (forums, quizzes, wikis, etc.) tends to offer third rate versions of those tools as opposed to best-of-breed versions. So, we develop integration strategies to embed in those top-line tools we separately invest in (lecture capture, turn-it-in, etc.) and we can do the same to replace forums and wikis. But then what do we end up with? A course management shell - and one with the burden of holding all of those baked-in tools together. That's the management perspective. For faculty and students, they end up contending with lesser tools (but gain better integration with the course management functionality and - very important - a consistent interface). The drawback of LTI is that as an integration method, it launches users into the 3rd party environment and its foreign interface, losing the UX consistency and forcing faculty into a new workflow. These are the (somewhat simplified) issues around managing the tools and features provisioned in the LMS. The issue of the LMS being closed seems non-pertinent for these reasons you’ve mentioned. It’s really a non-issue in our institution for the majority of faculty, many of whom insist on the environment being closed (to the extent of obsessing about dropped students being removed in near-real time). Us IT/Ed Tech types tend to commiserate with those faculty who are more of the explorers and who value open environments (and are willing to invest their time tinkering) but I think the business argument within the institution also makes it hard to consider anything but the traditionally closed LMS at the enterprise level. Sandbox and experimental open work (ala Wordpress, Drupal, etc.) is great to see but becomes so individualized that unless faculty are willing to learn it, extend it, and own it, it appears a waste of time. The other enterprise issue that happens with these experimental and other types of LMS “defections” is they take their students with them into a different (often one-off) interface and must guarantee the environment’s availability themselves. I’ve seen a few of the crash-and-burns when that goes bad. Student-centered tools and platforms are fascinating but the value proposition from the management side is that a majority of faculty want control of the environment (and let’s be clear, often for very legitimate practical and pedagogical reasons). The contract we have with managing tools is that we deliver them to faculty to use to deliver teaching and learning to the students. Breaking that assumption threatens the trustful relationship (explicit or implicit) we have with our faculty. Thanks for raising the issue. These are great topics that I’d love to hear alternative perspectives and ideas on. Lots more to talk about here. Like you, it's my job to provide tools that support all faculty and students, not just those who might think like I do. But I want to make sure that we don't endorse the most conservative view of teaching and learning and elevate it to the standard, while alienating those who want to innovate and experiment. I've said before the the LMS will die soon... about the same time as the ERP and COBOL... So yeah, I feel that I need to provide a consistent, highly-reliable, traditional LMS. (Didn't take long to become a tradition, did it?) But I want to do the best I can not to stop there and support faculty and student creativity as well as a dialog about what that might mean for the student. I can't make faculty do anything but I want not to prevent them from doing good things either. Wow, love this conversation! While I have shifted to doing almost everything outside the LMS (ad hoc combination of things, though would love to hear more details about Laura and Christina and Alan's models) - i hate the overly systematized nature of LMS's and of course their non-openness, plus their non-relevance to the "real" world. But I can understand why the less tech savvy faculty member would not want to "learn" so many new tools. Sure, google sites,google docs, etc., are quite easy to use (not google plus, it still confuses me for some reason, and I am quite tech savvy) - but for our faculty here, it just sounds like multiple tools to learn and overwhelms them. It's quite silly, really,because in reality, you still need to learn how each tool within Blackboard works, right? Just because you click "wiki" and get one does not mean it will manage itself. It's just Bb offers a wiki that offers "something less" than what you could get from a more open platform. Now, the privacy issue, I totally understand. But most social media have clear options with privacy levels (hosting location aside; and facebook's confusing settings aside) - but it is slightly more complex to set up privacy. All that said, I love what Alan about allowing people room to create and finding them do things you would not have anticipated. The question is, how do you support this kind of flexible innovation at an institutional level, and esp that most faculty don't want to be bothered and prob cannot imagine the potential. They're thinking, you spent years convincing us of the LMS and now it,s no good? (Got this reaction recently). Or could there be some sort of "suggested models" for how to do certain functions outside LMS? Like a google apps combo, vs a wordpress combo with certain plugins, etc? So faculty who don't have time to delve into their own thing can have a place to "start" and the IT folks can be ready to support the basics for faculty who need it? No easy answer, but if we don't encourage and empower our creative faculty to find new models, there's not much hope. If change is going to come, it's going to come by one faculty member showing another what they can do. I just want to be sure that we're creating the environment where that can happen, instead of settling for technology use that will create the illusion of progress. Wondering if you all think the Jim Groom/ Brian lamb piece published in Educause Quarterly recently about anti-LMS signifies a change of the dominant discourse in eLearning, given where it was published? Maha, thanks for reminding me of this excellent article, which certainly was an influence on what I wrote. (Everyone, go read this - Reclaiming Innovation -http://www.educause.edu/visuals/shared/er/extras/2014/ReclaimingInnovation/default.html.) Your question is a good one. I think in a funny way the title "Reclaiming Innovation" may mask the anti-LMS argument. I would like to think that hundreds of CIOs read that article and started to think about LMS's in a new way, but I'm not quite that optimistic. Can't believe I missed this series. I started a similar series, but in the context of a corporate LMS back in September 2013. Can't believe I let part one linger for that long. What I've come to believe about systems or platforms is that they aren't broken. They just are. Systems and platforms grow around a complex network of inputs, goals, and constraints. If we want to change those systems, we need to change (or change the way we see) those factors. One of those constraints I think we can influence at the system level, and downstream at the platform level, is the self-enforced constraint of context. One of the problems with LMS, they tend only to deal with the solo and facilitated context roles while (wholesale) ignoring the rest of the scale. Thanks for the comments. Whether broken or not, "We shape our tools and then our tools shape us" - Marshall McLuhan - that's why we can't treat them as inevitable but rather see them as they choices they are and ask ourselves whether we could be doing better. LMS Futures: Live in Vegas! LMS Futures: So What Does an LMS DO anyway?